MegaHydrate is the key that unlocks the potential of water as the medium for nutrient replenishment and waste removal at the cellular level. In a state of dehydration, body cells cannot assimilate nutrients and remove waste. Dehydration also occurs as a side effect of caffeine. Caffeine effects include anxiety, dizziness, headaches, sleep disorders, and many common ailments. MegaHydrate also helps fight the negative effects of alcohol, stress, and free radicals as part of aging. 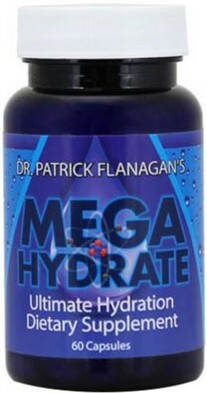 In addition to hydration, MegaHydrate is the most powerful known antioxidant food. Since it is a "pure" antioxidant that does not turn into a free radical itself, taken daily, MegaHydrate delivers far more Hydrogen ions than by eating pounds of raw fruits and vegetables or drinking gallons of "healing waters," also known as "glacial milk." Humans need Hydrogen to survive. It is the key to long life and anti-aging. However, due to mass food production, mineral deficient soil, pesticides, chemical fertilizers, over-processing of foods, chemical preservatives, and drinking over-chlorinated and over-fluoridated water, people do not get enough Hydrogen ions daily. Body cells become damaged, hydration levels decrease and cells age. In summary, MegaHydrate challenges the symptoms of dehydration and minimizes the process of aging. 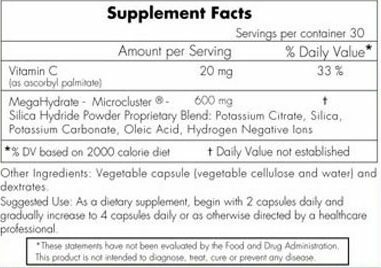 MegaHydrate is a dietary supplement that is considered a food grade supplement rich in antioxidants by the FDA. Antioxidant foods like MegaHydrate help defy the aging process. It is safe, having been tested and shown to have no known side effects. A powerful antioxidant that helps to neutralize harmful free radicals. Advances energy production and metabolic activity. Sufficient hydration supports stamina, memory, and mental acuity. Assists the ability of cells to utilize nutrients. Encourages defense against the effects of aging. For over three decades, Dr. Patrick Flanagan has studied the remote regions of the world where people live healthy active lives past the age of 100 years. While the diets in these regions differed dramatically, Dr. Flanagan discovered the amazing fact that the drinking water in these regions was almost identical and came from frozen glaciers that had melted. This water, known in some circles as "glacial milk," displays some very distinct physical differences from the water that most of the civilized world is drinking. The surface tension of glacial milk is much lower. This means that the water can be absorbed directly into the cells of the body with much greater ease facilitating hydration and nutrient uptake. It also means that waste materials can be removed from the cells more easily by the same life-giving water. Dr. Flanagan also discovered that glacial milk, or "life water," had very distinct physical properties of viscosity, heat, and energy potential. After decades of laboratory and field research and study, Dr. Flanagan uncovered what may be the most important discovery about the true nature of hydration. He discovered why the waters are so different and can hydrate the human cell so effectively where people of these remote regions live well past 100 years of age. Hydrogen is one of the primordial elements that fuels the development of all life on Earth. Provided by the Sun as rays of light, human beings cannot live without Hydrogen. While science refers to us as carbon-based life forms, man is actually a Silica-based and Hydrogen-based life form. All life on Earth is Hydrogen-based. When plants absorb sunlight, they store negatively-charged Hydrogen ions through the process of photosynthesis. When you eat unprocessed plants, your body's cells utilize the nutrients in those plants and, perhaps more importantly, the electrical charge of the Hydrogen ions in those plants. When your body burns Hydrogen and Oxygen, it generates the energy you need for every single process of life. As a matter of fact, nearly every life form on the planet utilizes Hydrogen and Oxygen to generate energy. The key is that without Hydrogen, there is no life. Hydrogen is the smallest known element in the Universe. All living things must have Hydrogen to sustain life. Hydrogen is the key to life, death, and aging. Without Hydrogen ions, there would be no life on Earth. As a result of Dr. Flanagan's discoveries, many Scientists now believe that the quantity of Hydrogen ions in plants and water is a qualitative indicator of its energy potential. Hydrogen ions are a key fuel and energy source for the human body. Negatively-charged Hydrogen ions can determine the overall health of every cell in the human body. Due in no small part to mass food production, mineral deficient soil, pesticides, chemical fertilizers, over-processing of foods, the addition of chemical preservatives, and drinking over-chlorinated and over-fluoridated water, millions of individuals are not getting enough Hydrogen ions daily. Cell damage occurs when the body has insufficient Hydrogen ions (and sufficient Oxygen). The body's cells become oxidized like Oxygen rusts iron. When certain chemicals in the body lose an electron, they become positively charged (and are called "free radicals" or "oxidants"). These chemicals roam freely through the rest of the body stealing electrons from other cells. Free radicals damage cellular DNA. The majority of modern science has come to the conclusion that free radical damage in the human body is the cause of aging. Science has also discovered that aging is not a natural function of time passing. Aging is evidence of the damage to millions of the body's cells through oxidation. This oxidation is due to the lack of Hydrogen ions that are available to stop free radical damage. The human body is under siege by free radicals 24 hours a day, 7 days a week. Pollution, chemicals, fumes, toxins, and other poisonous materials only add to the damage that the body endures on a daily basis. The amount of free radical damage is equivalent to the amount you have aged. The best-known antioxidants prior to Dr. Flanagan's pure Hydrogen ion product were Vitamin E, Vitamin C, Green Tea Extract and Grape Seed Extract. Both Green Tea and Grape Seed Extracts have many times more antioxidant potential than either Vitamin E or Vitamin C. Scientific evidence proves that MegaHydrate is hundreds of times more powerful as an antioxidant than either Green Tea Extract or Grape Seed Extract. There is no known antioxidant more powerful than MegaHydrate. More importantly, because MegaHydrate is so pure, you get far more Hydrogen ions from a daily supplement of MegaHydrate than from eating pounds of raw fruits and vegetables and drinking gallons of water from the Hunza region. The active ingredient in MegaHydrate is Silica Hydride. One very important characteristic of the antioxidant capacity of Silica Hydride is that it is the only antioxidant that does not turn into a free radical (i.e., oxidant) once it has neutralized a free radical by donating its electron. Negatively-charged hydrogen turns into benign gas and/or turns into water. MegaHydrate contains the active ingredient Silica Hydride, a compound known to positively affect the "zeta potential" of blood cells. Zeta potential (x) is the electric potential, or charge, that exists in a hydrated particle and the surrounding solution. Zeta potential is an important and useful indicator that this charge can be used to predict and control the stability of colloidal suspensions. The greater the zeta potential, the more likely the suspension will be stable because the charged particles repel one another and thus overcome the natural tendency to aggregate. Zeta potential is an electrical charge that describes how far apart cells are. Greater zeta potential indicates more space between cells. PHOTO 1 below shows a microscopic view of a blood sample from a subject with low zeta potential. The blood cells are clustered together and trap waste elements between them. Note the clustering effect may be a result of dehydration from caffeine, alcohol, heat, and stress: all commonly found in people today. The test subject was given 500 mg (or two 250 mg capsules) of Silica Hydride - the active ingredient in MegaHydrate - mixed with 8 oz of water. PHOTO 2 below. Twenty minutes later, another blood sample taken from the test subject was viewed under a microscope (as seen in PHOTO 2 below). The evenly-dispersed blood cells indicates high zeta potential. The blood cells appear pristine, as if the substances trapped between the cells have been cleansed. The surface area of the cells has increased allowing exponentially more nutrients into the cells and more toxins to be removed. MegaHydrate's Silica Hydride is the only known supplement to dramatically increase zeta potential. Nationwide Food Consumption Surveys have shown that a portion of the population may be dehydrated. Why do people lack hydration? This may be due to a poor thirst mechanism as we get older, dissatisfaction with the taste of water, the consumption of caffeine and alcohol, climate controlled environments (both heated and air conditioned), and excessive exercise. With water loss at 2% of body weight, individuals experience impaired physiological and mental performance. Double blind placebo studies clearly demonstrate that the Silica Hydride in MegaHydrate dramatically increases total body water in just four weeks! MegaHydrate provides natural pain relief from headaches, sore muscles, and inflammation of the joints.†Results may vary. As a dietary supplement, begin with two capsules daily and gradually increase to four capsules daily or as otherwise directed by a Healthcare Professional. Keep tightly sealed. Store in a cool, dry place out of direct sunlight.